1Start by placing your sausage stuffer into the refrigerator or freezer until it is very cold. In the meantime, measure out the salt, pepper, tarragon, and KISS, and add to the lamb. 2Mix with very clean hands until the sausage is properly emulsified; you want it to begin to bind together and to evenly distribute all the seasonings. Place in the refrigerator and cool. 3While the sausage mixture is cooling, soak and wash the hog casings. Not only does this get rid of any unwanted materials, but it also alerts us as to where any holes are. 4Bring out the cooled stuffer, lubricate the stuffing tube (with a bit of flavorless oil) and feed the casings onto the tube. Let about six inches hang off the edge of the tube (this will allow you to tie the sausage off in the end). 5Fill the stuffer with the lamb mixture and begin the crank the meat through the stuffer. Allow the meat to come out in one long coil. Once all the meat has been pushed through, tie off the end of the hog casings. 6Now you can begin to make the individual links. Decide how large you want them to be, pinch off a section, and twist to make a link. Continue doing this all the way down the coil until you have made all of your links. 7Once your links are made, look for any air bubbles and puncture them with a needle. If any air bubbles are present in the sausage links, this will cause the sausages to explode in the pan. 8Now hang your sausages, being sure they don’t touch, and allow them to dry for about an hour. Then move to a container lined with paper towels and place in the refrigerator overnight. 9The next day, begin with the tzatziki sauce, peeling and finely processing the cucumbers along with the garlic in a food processor. Squeeze out any extra liquid from the cucumbers and mix into the Greek yogurt. Stir in all of the other ingredients, salt to taste, and then refrigerate. 1Heat the vegetable oil to 350°F. Deep fry in small batches until crispy, being sure to season with salt and pepper directly after they come out of the fryer. 2Remove your sausages from the refrigerator and cut off individual links. Sauté in a frying pan until nicely caramelized, then place on a rack into a 350°F oven until fully cooked through. 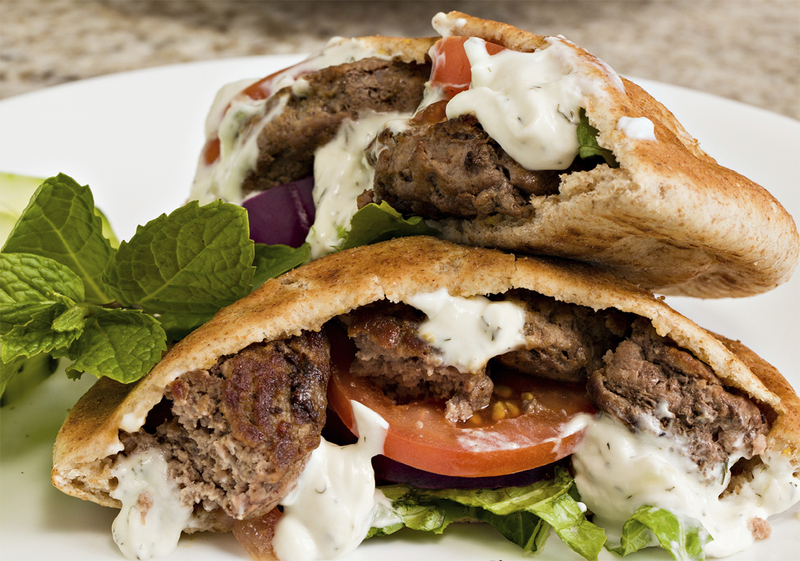 3To serve, place the sausage on a warmed hot dog bun and drizzle with the tzatziki sauce. Serve alongside the pita chips and extra tzatziki sauce, if desired. ©2013 Robyn Comer. | All rights reserved. Republished with permission by Chef Sous LLC.